Shortly after the liberation there were made plans in the Netherlands for the formation of Dutch units. Which task it should be to be put into action in Indië to liberate the conquered. Therefore they formed an Expeditionary Force (EM), which were modern trained with modern arms. For which they started to recruit people to the so-called task battalions. This unit's was supposed to be put into action in the liberated area to assure the peace and clean up any left behind resistance. When the Japanese capitulation took the world by surprise the EM was still only a cadre being educated. While GBI had a lot of men who had weapons they did not know how to use them. It was hoped they could be trained in Australia but so far had it not gone. Only a minor part the later “5th Company” reached Australia. Another detachment departed later with the bad named “Sterling Castle” with the same destination. The rest stayed behind in England for the moment. Anyway it succeeded in training this units fast too. Although there still went a time before they could fulfil the need for troops in India. At that moment it was the opinion of the Government that they must make a proclamation to the soldiers who had already been trained under the name “Light Infantry Battalions” and did guard duty around country and first of all in Germany. These battalions were armed and had a little battle experience and most of all they consisted of personnel who at the first place had signed up as OVW and therefore also volunteered to serve in the COUNTRY OUTSIDE EUROPE. In August the commanders of these units were called to Apeldoorn, where the Staff of the Netherlands Armed Forces was placed, for meetings about transfer to Indië. It demanded a quick reaction and quick answers. Everyone could see it was necessary to run every risk. But the Government could not foresee that this expedition will be so huge as it did. They did not expect that there would be any kind of combat. They looked at these battalions as some who should fill in the gap until a new army for Indië was rebuilt. Therefore so they could be sent out there for the second half of the year they were shipped out without any heavy weapons. So on 16th September 1945 the first battalion 2-13 R.I. from Limburg, which was pulling guard duty in München-Gladbach, was shipped out. It arrived in England on 18th September and was stationed in Aldershot. Because it was the plan that these troops should get their equipment in England. 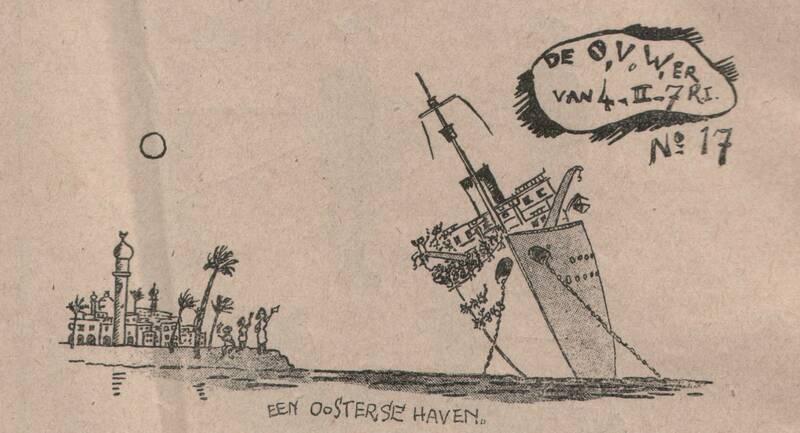 On 28th September the 1st Battalion Stoottroepen (which for most parts also consisted of Limburgers) arrived. Beside this the 3rd and 7th from the same Regiment (the last later renamed 2-14 R.I. This was the first. They were also the first who were shipped out for India after their stay in England. This stay was very special since it was the first time they had been in surrounding which had no marks after the war. It also had its shadow sides since there were only few places to visit. First of all in the area of entertaining got the troops here their first bad experience that Dutchmen is as a piece of wood which only rarely is put abroad like their amount. As they arrived the OVW was shipped out in the “Alcantara” and bed their good byes to the British Island. Their destination was India. For these soldiers who had no anticipation about how huge the archipelago was it could just as well have been Amsterdam for everyone who had ever visited the Netherlands. They made no sad thinking about where they were shipped out. While they were underway the information’s about the situation in Indië became worse and worse. Shortly before arriving in Tricomalee the radio proclaimed that Soekarno had declared war on the Netherlands. This took some by surprise actually most of them for others it was their worst horror story and horror pictures showed up. None of these reactions were surprising since no one could foresee what would happen. Not even on Tricomalee when a Dutch officer went onboard and held a speech, which was confidential. They only knew a little about that India would not be the end goal but Malacca. The next harbour was for this reason Swettenham. They were not allowed on land but were awaiting further orders. They arrived after two days and sounded “To Java”. The ship set course south passed Singapore and the Although so far they turned around against Singapore and Swettenham. Here the 2-13 R.I. set foot on land on 11th November and the rest set foot on land at Port Dickson on the following days. Around one week later followed the second ship with OVW’s among whom was 2-6 R.I., Battalion Jaegers (Hunters) and 1-8 R.I. at the same time found “Sterling Castle” its end at Malacca at the island Penang. ______________________________________________ OVW mean Oorlogsvrijwilliger or someone who volunteer for war duty. GBI mean Gezag Battalion Indie or Task Battalion India.